Kim Barnouin has got a mouth and she’s not afraid to use it, that is, to promote personal and environmental health and well being. The recent, in a string of sassy and savvy Skinny B^tch books, Home, Beauty & Style, Kim offers a guide to, in her words, “Cutting the crap out of your life.” She explains in extensive detail the dangers of chemicals hidden in common household products ranging from items found in the home, beauty products and personal style. She may have a salty mouth but the girl knows her chlorophenols from her xylene, proving she's done her research. But there is hope, amidst the loads of despair-worthy facts about the nasty and hazardous chemicals lurking in the home and environment, Kim offers natural options from common cleaning and beauty substitutes found in the pantry to furniture and clothing brands that do the body and environment good. The recipe is SUPER simple - not sure I can post it here, but I guarantee, if you eat out of your pantry and not restaurants for your three squares, you probably already have everything you need. Wash with microfiber mop. To all you Mrs. Cleans out there don’t do anything crazy like shave your head- then use your easy peasy floor cleaner to polish it. 4. Plastic isn’t good m’kay, especially the ones labeled in teeny-tiny often opaque numbers: three and seven. There are many reasons this is true from using natural resources in production, the manufacture process itself and then, wait for it, what the plastic does to us when we consume from it. Kim suggests cutting plastic out of our lives, completely. Which is hard to do, I know, but no one ever said this thing called living was going to be easy. And the alternative, from hormone disruption to infertility and a host of other chilling disorders, makes me think I’ll make the effort to get plastic out of my life. 5. Feminine hygiene, okay this wasn’t news to me, but it’s kinda my platform so I’ll just riff for a minute. Not only do the plastic applicators from tampons harm marine life and take, get this, upwards of 500 years to “disappear,” the actual contents of the tampons themselves could be damaging, your, you know- lady parts. So you may ask, well what then, what am I supposed to wear? A diaper? There are loads of alternatives that aren’t yucky at all, really, what is yucky are the infections, exposure to chemicals and harm to the environment the conventional ones cause. For more on this, please see my other blog, Ladies Holiday. We discuss it often. 6. Everyone wants a pearly white smile and no doubt many of us use whitening pastes composed of unsafe chemicals, usually not disclosed and certainly the hazards of them aren’t printed on the label either. But unless you’re hoping to put yourself at risk for liver and kidney damage and other issues along with white teeth, choose your teeth cleaning products carefully and if you can’t read the words because they aren’t there, see page 143. Alternatively, Kim suggests once a month mix baking soda with water, dip in your toothbrush and scrub lightly. Spit it out and rinse thoroughly. 7. Kim offers a whole slew of hair and face care from shampoo and conditioner sans the scary sulfate twins (listed as probable human carcinogens.) Kim also informs that these ingredients are used to degrease car engines. No thank you. My hair may take on a bit of sheen after a run, but it isn’t that greasy for goodness sake. When I read the long list of ingredients on my shampoo bottle I said “ew,” out loud and practically choked in the shower, but I will replace it with something gentler on my head, hair, and the planet. 8. So not only are there chemicals in the items we consume in the form of food and beauty care, but household items, including furniture made out of press board, air fresheners and eek! even children’s pajamas contain seriously sketchy stuff. This takes a lot of careful reading and digesting and I will take it one step at a time. No sense in tossing everything in my house out in one go, that would, after all, be very wasteful, but as things need replacing, updating or refreshing I will opt for choices made conscientiously and be an informed consumer. Good questions to ask are, where was it made, how was it made, what are the components, chemicals, etc. Chances are the simpler and more straightforward the answer, the better it will be for us all around. 9. 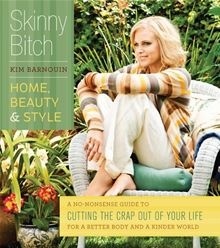 I found the Skinny B^tch via her first book, co-authored with Rory Freedman about health and diet. The title intimidated me at first, then it kind of endeared me and I thought of myself as part of a skinny-b^tch-inner circle, even though I don’t think I’ve been called skinny since the third grade. Since the book was all about what we eat and thereby included animals, specifically not eating them, Kim would have been remiss to not include a section in Home, Beauty & Style about fashion and in particular how animals have no place in it. Say no to leather, silk, fur, down and a whole list of other fibers taken from very, very cute critters against their will. Did I mention cute? Let them keep their coats! 10. Last but not least, Kim taught me that I can keep myself and my family healthy and happy by being vigilant, making informed choices and not giving into the buying frenzy that threatens to overtake me anytime I enter a space that has a credit card machine- most stores. I may not be a bona fide skinny b^tch, but when it counts I can sure act like one. Any green tips to share? Or great resources- b^tchy or not? Please share!